Averys Auto Floor Mats.Beatifully designed, colored and constructed. 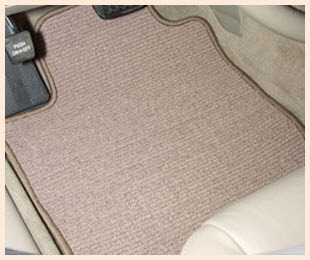 Auto Floor Mats from Avery’s are manufactured of the highest quality materials. With over 4,000 individual patterns I'll bet Avery's can match the floor of your car, van, SUV, pickup, big rig fleet vehicle or golf cart as good as or better than the OEM. Avery's Luxury Touring car mat is a European Berber Style mat with excellent durability and a plethora of features. Started by Delbert Avery in 1982 the company is obsessive about quality, starting with the best materials and finishing with the utmost in craftsmanship. Today Avery's is a division of Guardian Products Inc. and has the ability to design one of a kind car floor mats and the flexibility to create Special Edition Packages for car dealers and others in the automotive aftermarket. Avery's is also a major supplier of vinyl heel pads to the automotive industry. OK, enough on Avery's company info - here's the scoop on their car mats. Note: For more info see our Averys Car Mats alternate page. Vacuum these car mats to keep them clean unless you sleep in your car. Then you should also clean these mats with mild soap and water. Use universal absorbent mats to prevent these great Averys' Mats from getting wet and dirty in the first place. Avery’s Touring is a plush, densely woven auto floor mat, made of 22 oz. tufted nylon yarn. It has a matching woven edging around the mat perimeter to prevent fraying. A waterproof rubber nib backing is used to prevent these mats from slipping. You clean it up with soap and water. How easy does it get? The Grand Touring is an upgrade to the Touring mat. It’s made from a 28 oz. tufted super soft nylon yarn and is a great complement to the interior of a new car. Have the edges of this beautiful auto floor mat serged to really make it stand out. Besides the waterproof rubber nib backing this mat is thick enough to dampen road noise and help keep your feet warm on those cold winter days. Avery's Grand Touring Car Floor Mats are designed to perfectly fit your year, make and model vehicle. Select Touring mats are made from a special 28 ounce nylon yarn that has been specially treated to resist and repel stains. These auto floor mats are also treated with an anti-microbial to prevent odors and smells from things like rotting food, spilled milk and other food gunk that normally makes your vehicle uninhabitable by anyone with a refined sense of smell. The mat is densely tufted with a low pile height to reduce stain infiltration and make the mats easier to clean deep down. To keep these mats from slipping, Avery's adds a multi layer non skid backing they call Action Back. Action Back has a thick urethane core to provide extra cushioning, reduce road noise and keep your footsies warm in times of cold. Avery's Luxury Touring mats are made from a 42 ounce poly blend yarn that has been treated with a marine quality UV protectant. The UV protectant and the natural stain resistance of berber make these mats ideal for your golf cart or any other vehicle that needs an appearance upgrade. The European Styling of these mats lends an air of sophistication to the interior of your vehicle. They are available in 4 colors, have nylon serged edging, are very durable and can be embroidered with colorful logos and text.